Scotland’s cricketers will face England in Edinburgh next summer in a One Day International. Kyle Coetzer’s men will take on Eoin Morgan’s outfit on June 10, 2018 at The Grange in Stockbridge. The sides last met in Christchurch, New Zealand, in 2015 during the World Cup when a century from Moeen Ali helped England to victory. 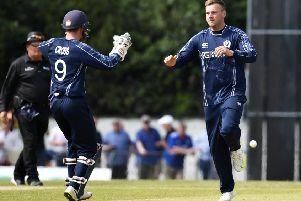 Cricket Scotland CEO Malcolm Cannon said: “Only very rarely does Scotland get to host its neighbours in a one day international so it is with great excitement that our squad can look forward to preparing to face the auld enemy. Tickets are likely to go very quickly so we would encourage everyone to get them quickly.